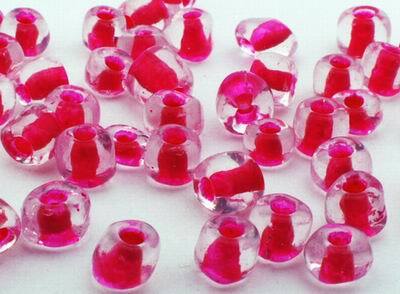 Price is per 500 beads - each measures 4mm x 3mm or 6/0. Made from opaque glass. Seed beads are colorful and extremely versatile, just waiting to be transformed into elegant creations. They are uniformly round shaped, spheroidal, ranging in size from under a millimetre to several millimetres. "Seed Bead" is a generic term for any small bead. They may be used for simple stringing, or as spacers between other beads in jewelry. Larger seed beads are used in various fiber crafts for embellishment, or crochet with fiber or wire. Seed bead machinery uses glass rods softened to a red heat, fed into a steel die stamp that forms the shape of the bead with a reciprocating needle that forms the hole.